Emerging food brands always seem to ask the same question – how do I get on the retail shelf? In their eyes, the retail shelf represents the most significant “win” they can imagine. Smart emerging food brands know to chase more than one channel to increase sales. They and at all their options including specialty vs. mass retail, bulk, foodservice, and online sales but that is a post for another day. This year’s buyer’s roundtable brings together five professional food buyers and managers from retail and food service who offer advice on how to best get them to “buy” an emerging brand’s food product. Questions about talking to a retail or food service food buyer? 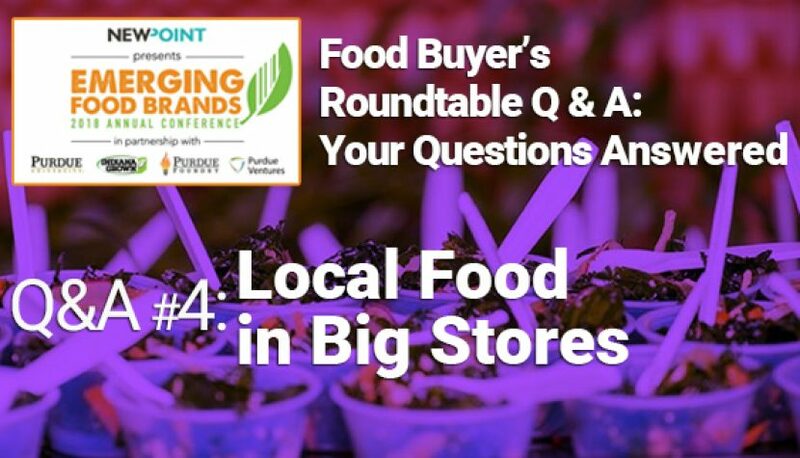 The content of this Food Buyer’s Roundtable (and all program content at our conference) was submitted as questions during registration by the 64 food company/brand attendees. Our expert presenters then addressed the questions—and more—in their programs. In the coming weeks, we’ll be posting each presentation to the “Intel” section of our website. So check back often! Tom Coleman, Director of Retail Dining with Purdue Dining & Catering, Purdue University. Responsible for the oversight of 25 retail operations on campus. These operations consist of street brands, private brands, and convenience stores. Eric Wine, Grocery Specialist for Fresh Time Farmer’s Market covering all Indiana stores. Fresh Thyme Farmers Markets provides a healthy and fresh new way to grocery shop. Bob Baesler, President of Baesler’s Market in Terre Haute and Sullivan, Indiana. In business since 1894, Baesler’s Market strives to maintain fast and friendly customer service, as well as the finest cuts of meat, premium produce, and delicatessen. Rick Hopkins, Director of Food & Beverage at Market District responsible for the fresh departments of our Caramel, Indiana store. Market District is dedicated to blending all of the excitement of a gourmet specialties boutique with all of the freshness, value and everyday products you’d expect from us as your trusted local grocer. Brian Moore, Director of Merchandising at Sysco, Indianapolis. Sysco is the global leader in selling, marketing and distributing food and non-food products to restaurants, healthcare, and educational facilities, lodging establishments and other customers around the world. Question: How can I shift my product from the local shelves over to the center aisle shelves? Rick Hopkins: My answer might be the wrong answer to what the rest of the group will say, but I would say, don’t. Don’t try. Stay local. Stay focused on the product. The center stores are dying in our culture of every national brand out there. It’s going to be easier and easier to pick up your phone, order it from your couch on a highly competitive, national brand product. If the goal is to move lots and lots of product, that’s certainly the balance of your decision. But if you’re in a market that can support local, that can give you the recognition; I’d stay put. Don’t be in a big hurry to get it off of that special focus shelf or into the conventional plan-o-gram. On that shelf, you’re competing with typically a lower price point, a more well-known product, and you’re lost on the third aisle up, fourth from the left, and surrounded by 15 other version of your product that they may know more. Eric Wine: For multiple chains, we have our things we like to call schematics. A lot of time, these are coming down from our corporate office that tells us, hey. This is our soup shelf, and you have to have soup A here, soup B here, soup C here. They can stay pretty stingy about things like that. However, to his point, I don’t necessarily think the center aisle is the best place for local to be at this point. My opinion. However, for Fresh Time, we do have things that we call local alternative schematics. It’s not impossible to do, but it’s sometimes not just as easy as yeah, okay, we’ll just put it here. Bob Baesler: Well, these guys are a lot bigger than I am, but I disagree. I think it’s the same mentality as with organics. Organics for a long time, they felt like it should be segregated by itself. The problem was that there was only a small percentage of people that wanted organics. The fact that there’s an awful lot of people that will buy organics, but they never go into that section. Kroger nationwide integrated organics for that reason. I think we had a four-foot section with local foods, and I think it made sense to introduce it, but I do believe when someone is looking for a salad dressing or a barbecue sauce, they’re looking in the barbecue sauce section. If you’re not in that section, I think you’re missing it. It’s two different opinions, and I’m not saying I’m right. As I say, they’re bigger than me, but I think that’s the idea behind integrated. Tom Coleman: Well, for us, I mean we’re much smaller players than these guys, but our distributor does what they call a store reset, on a yearly basis. They’ll come in and set the store how they feel it will best benefit them, as well as us. I think it comes down to commodity and where it stands. I think local is so popular right now, that if you apply that word local to it, and I think someone suggested that even if we could also use that to dig down a little bit further. Question: What is your biggest struggle in dealing with local/smaller food vendors? Eric Wine: Okay, this is interesting because it is a little bit of a struggle in a sense. You are dealing with, and I use the word, Tyson. If you’re involved in chicken. Or Sarah Lee, if you’re in a bakery good. In a sense, you don’t have the toolbox that they have. But I don’t know that that’s a struggle. I don’t. I think, and it goes back to the last question. Embrace the fact that you’re special. That’s the way we look at a smaller vendor. It’s a specialized vendor. You don’t try to be like the big guys. We would like you to be who you are. It’s not, we understand you don’t have the same toolbox. We’re not going to ask the same things of you. Rick Hopkins: to keep it short, I would say there is not a lot of struggle. The one struggle typically is seeing an exciting new product from somebody that’s not quite ready to come to market yet. Having a product, having something they believe in, that isn’t quite ready to either be packaged, to be distributed, to meet the demand that some of the grocery stores might put on them, as far as the sheer volume that it might take to stay full and stay in stock. That’s really sometimes the struggle, is seeing great things out there that just isn’t quite ready, and being patient and encouraging to those small vendors, by helping them either get connected with people that can help them move quicker, or find a way to get ready as fast as possible, to get that great product into the stores. Also, wanting to support local. I know for us, a lot of times it comes down to space. Going back to the last question, where is the best place to promote your product in our store? Where is the best place that we can offer you in a particular store to try to promote your product and get those sales on those? Sometimes, depending on the footprint of the store you’re in, that becomes a big problem. We want to promote as much local as we can. Sometimes it can be, where can we put it to give it that most exposure? Bob Baesler: Our biggest struggle would be what I alluded to earlier, was out of stocks. For us, if we’re committed … Well, with our distributor, we have to commit to a specific volume. Sometimes, it’s the volume that we’re not able to commit to. We’re not able to meet the distributor’s needs, in terms of moving that product through the process, the cycle. Sometimes as a small vendor or local provider, it’s good to maybe do the grassroots from your end, regarding trying to generate that volume. Ultimately, some people can take advantage of that product. Whereas, and if you come to market with those goals in mind, I think it makes it a lot easier for us to bring it on. Question: Many foodservice companies and retailers are large, out of state corporations. What interest do you have in selling a locally produced product? Brian Moore: I’ve been waiting on this one all day. We get this all the time. You’re not local. What I would tell you is we’ve all talked about how it’s a hot topic, but what we try to make people understand is, we’re part of the community. In our case, we are servicing your local restaurants and your local hospitals, and your local schools. That’s what we do. We can throw facts and figures at you. Yes, we are the largest food service employer in the state of Indiana, but more importantly, it’s about community. That’s why we want to get involved in this. That’s why we’ve been involved in this. That’s why it’s very important to us. Rick Hopkins: When I read this question, I think of us as that large, out of state retailer that has to commit to whether they’re going to be in the local business. I hope that our actions have spoken for that, in our store, Pittsburgh being our home base, doesn’t resonate on our shelves. Cleveland, Columbus, the other bigger marketplaces that we have a presence in, have a value, but Indiana screams for Indiana products. We try to have a Midwest appeal, but we’ve had to reinvent what local means to us. At the Market District, to get away from that plan-o-gram mentality of a conventional, local based, in Pittsburgh, and embrace that we’re six hours from the mothership, and need to have a stronger presence of local products as we possibly can. Eric Wine: Again, as he said. Also, working not only within the store but working with the community. I know we spend a lot of effort in our marketing departments, going to schools, churches, universities, making partnerships with folks like that, to integrate us into that local community. Again, you would be shocked when someone says this is not local honey. The honey is 50 miles; the farm is 50 miles away from that store. To those folks, it’s not local honey. It’s not. Making your true partnership with that community, and always, not just selling your groceries, but helping to support the community, as well. Moderator: You touched on something Eric—the definition of local. Is it 50, is it 400 miles, is it 100 miles? What is it? That is the thing that I think that you may deal with on a day to day basis. Eric Wine: When we first started, it is 100 miles. It’s gotten a lot smaller since we started that. Rick Hopkins: Our company defines local for any of our stores as 150 miles from the nucleus of that store, to be considered local. Again, we’re bridging the gap of some of that, to include a little bit more Midwest. For where we are, we include Illinois, Michigan, Ohio, Kentucky, Indiana, as that range that we draw from. The true, local definition for our company is 150 miles. Bob Baesler: Well, before Indiana Grown, we were [inaudible 00:43:40] homegrown. That would be basing it on the state of Indiana although we’re right on the border with Illinois. By rights, we should include part of that, although we usually don’t. Local for us has been the state of Indiana. Question: How do you stay ahead of food trends? Brian Moore: For the most part, it’s from you folks. It’s from customers of ours. They’re the ones that give us the ideas. They give us some trends. They’re the ones that are using their imaginations. We’re learning more from our customers than we do anybody else. Rick Hopkins: I couldn’t have said it any better. It used to be that we were the experts and the customers came to us for advice and direction. Now, the customer comes armed with more material, more information, and sometimes, depending if they’re well traveled and eaten around the world, more educated on some of the more popular trends and the diverse products available to them, then we’ve ever been. To stay technologically attached to what’s happening, to have an innovative group that’s always looking at what the food trends are and to try to keep on the cutting edge, and to partner again locally, to support the local trends that are an essential part. Also—seasonality. I think when we talked about food trends, seasonality has to be still addressed. That the trends of a spring experience aren’t the same as a fall experience. You have to be prepared to be at least that flexible in your sets and in your focus on your foods being offered, to make sure that that is represented first and foremost, trying to stay on top of the trends that are happening. Bob Baesler: I agree. Our customers, there is no question. If we look at trends on the West Coast and East Coast, and in the Midwest, we’re always a few years behind. Even though if we would study those, it would be a few years before we would be in tune with those. Both coasts, customers a few years ago on gluten-free, when you started having a customer every hour asking about gluten-free products, it makes you want to carry gluten-free products. Right now, keto seems to be an item that everybody is asking about. It’s a trend that our customers are asking for, and we’re trying our best to satisfy that. Eric Wine: I found that Google is your friend in the stores at times, with some of the requests. As all these nice guys have said, we are learning from our customer base at this point. We can proclaim to be experts, but we learn as much from what our customers want, as what we’re trying to sell you. Tom Coleman: We learn a lot from our customers. We often have advisory committees. We have them on a monthly basis. They’ll bring forward to us things that they’re interested, that we’re not necessarily carrying. We always try to meet our needs. I would say out of that; it’s probably publications: magazines, food shows, anything that gets that product in front of us. This is the 4th and final in our series of “Food Buyer’s Roundtable” posts – and our 2018 Emerging Food Brands Conference! It is always a pleasure to hear from emerging food brands that have attended our conference and/or have been following our conference workshop series. I’d love to hear from you if you have questions about anything you’ve seen in this series or, of course, just want to talk food marketing and growing your brand. 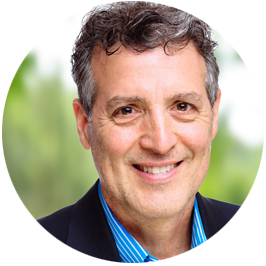 Contact me at patrick@newpointmarketing.com.